Birthplace: St. Joseph, Missouri, U.S.
Eminem (Marshall Bruce Mathers III) is an American rapper and producer. He has released 8 solo albums. Songs: "My Name Is", "The Real Slim Shady", "Stan", "Without Me", "Lose Yourself", "Just Lose It", "Crack a Bottle", "Love the Way You Lie", "The Monster". He is regarded as the greatest hip-hop artist of all time. He has sold almost 200 million albums worldwide. He is the best-selling hip-hop artist of all time and the best-selling artist of the 2000's. He has won an Academy Award, 15 Grammy Awards, 4 Brit Awards and 8 American Music Awards. He has also been nominated for a Golden Globe. He has been married twice to Kimberly Anne (Kim) Scott and they have a daughter together. He has been sued many times by his mother and his ex-wife, Kim. His life has been scrutinized the last 2 decades. He is friends with Elton John, despite the fact that his songs' lyrics have been considered homophobic. Eminem performing at Lollapalooza 2011. Eminem and Rihanna live in concert singing "Love the Way You Lie"
Eminem is a famous American rapper and producer, who was born on October 17, 1972. As a person born on this date, Eminem is listed in our database as the 1st most popular celebrity for the day (October 17) and the 2nd most popular for the year (1972). People born on October 17 fall under the Zodiac sign of Libra, the Scales. Eminem is the 3rd most popular Libra. Aside from information specific to Eminem's birthday, Eminem is the 12th most famous American and ranks 4th in famous people born in St. Joseph, Missouri, U.S. 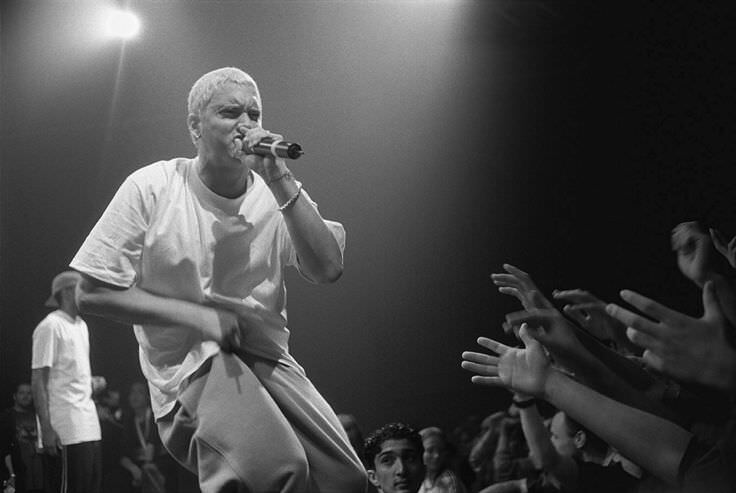 In general, Eminem ranks as the 22nd most popular famous person, and the 3rd most popular rapper of all time. “The Famous Birthdays” catalogs over 25,000 famous people, everyone from actors to singers to scientists to serial killers and more. If you're curious to see who was born on your birthday, you can use our database to find out who, what, where, when and why. You can search by birthday, birthplace, claim to fame or any other information by typing in the search box, or simply browse our site by selecting the month, the day, the horoscope, or any other clickable option. 4th born in St. Joseph, Missouri, U.S.